It’s confirmed!! 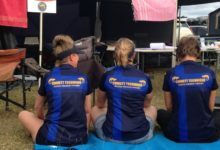 The Emmett Technique Angels will be again joining the 2018 C2K Ride providing muscle release therapy for all the riders and support crews. We are so excited to be part of this amazing ride, our third year volunteering our time and hands to help you, the riders make it to Karumba. It’s a gruelling undertaking riding over 780km’s and we look forward to providing muscle release and pain relief to see every rider achieve their goal to ride into Karumba in one piece. Over the next few months we will introduce our awesome team of therapists and let you know how we can help you reach your goal of riding all the way from Cairns to Karumba. For a note donation we will be providing treatments to ease pain and discomfort before breakfast, during the day’s ride, and in camp at the end of each day at our special EMMETT Technique tent city.